Happy (716) Day at the Fest! 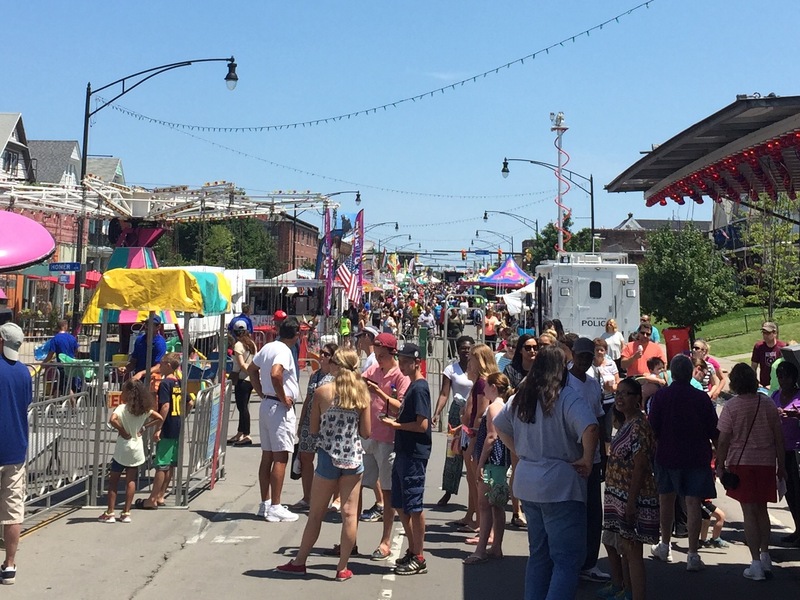 Today begins the annual four-day celebration on Buffalo’s finest avenue of the Italian heritage and everything that comes along with it. Coincidentally, it’s also the celebration of Buffalo Day: 7/16. So in the spirit of helping fest-goers while finding cool ways to use our area code, I’m going to give you my recommendation on what to buy at the Italian Festival if you had exactly $14 in your wallet. $7 – Steak and Dandelions from Lombardo’s. Don’t be scared of the dandelions. They’re sauteed in butter and garlic and are glorious. The cuts of steak are well worth the price too. $1 – Bottle of Water from Bing’s. The coldest, purest, wettest, purified spring mineral water around. OK maybe not, but a buck is definite the cheapest. Stay hydrated people, it’s hot out there. $6 – Stuffed Pepper Roll from Molinaro’s. Sausage and stuffing with three cheeses, rolled in dough and deep fried. Healthy AND delicious! An alternative could be to find one more dollar and blow it all on three slices of Campi’s Pizza. Just throwing that out there. Oh, and by the way, they have TWO Campi’s Pizza stands this year – one at Commonwealth and the other at Virgil. Mind blown. So there are some options for you. Hopefully you have more than $14 because there are a lot of incredible eats to be enjoyed…and I didn’t even talk dessert! The usual bakery suspects are all there filling and serving their cannoli, feel free to reference the extensive research done in 2013 to help with the choosing. Buon appetito! God Bless Buffalo. Go Bills. I just completed the Grand Slam – conquering the Italian Fest all four days. Yes, I have it easy being just a one block stroll away. But that didn’t appear to stop those that needed to bike or drive their way in. Nor did the weather on Saturday, which still drew a good crowd despite the rain. As an Italian-American who grew up on so many of the foods and traditions shared at the fest, it’s a great source of pride for me to have the Italian Festival located in North Buffalo – where I call home, and, according to the latest census, more Italian-Americans call home than any other neighborhood in Western New York. While North Buffalo today is a great conglomeration of people – a melting pot for sure – it’s nice to have the focus on one of the main cultures that helped shape the neighborhood. To Campi’s Pizza and Romano’s Bakery: your welcome – I made a significant contribution to your bottom line this week. To the North Park Theatre: nice touch with showing Italian movies all week! To The Public House of Buffalo: thank you – your new spot served as a safe haven from the rain on Saturday and your staff, atmosphere and beer list gave me 72 of reasons to come back. All in all, I couldn’t be happier with the direction the festival keeps heading with each year seemingly bringing more and more Italian traditions and culture to the forefront. There’s so much more to our heritage than just the typical foods and songs everyone can name, and I think that’s really starting to show at the fest. Can’t wait for next year! Ciao!